Christensen wrote in his book “The Innovator's Dilemma”: During the early stages of an industry, when the functionality and reliability of a product isn’t good enough, companies must compete by making better products. A proprietary and interdependent solution is the right solution to knit all the pieces together in an optimized way to achieve the best performance. Once the technology becomes matured and good enough, industry standards emerge. 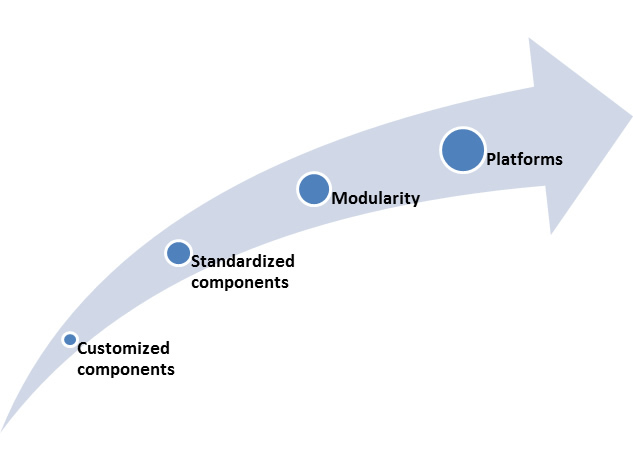 That leads to the standardization of components and interfaces, which make companies specialize on the overall system, and the architecture of products and components become modular. The successful companies must compete to be flexible, simplicity, convenience, low cost, responsive and fast time to market. These companies are active to use modular components and open systems. This theory has been proved in personal computer, MP3 players, cellphone, aircrafts, medical devices and software. This helps explain why IBM, General Motors, Apple Computer, RCA, Xerox and AT&T, as the most integrated firms during the not-good-enough era of their industries’ histories, became dominant competitors. Will Robots follow Christensen’s theory? The industrial robots and service robots are in the different development stages. Traditional industrial robots are mature and good enough to the mass production of iPhone and Volkswagen automobile. The traditional industrial robots are perfect for the mass production because they are highly efficient, accurate, power saving and reliable. These industrial robots can also be easily integrated to the whole manufacturing product lines as a standardized “Component”. To the industrial robots companies, the best way is to use modular approaches to make robots better, faster, cheaper, more efficient, and more accurate. On the other hand, most of the service robots are in the early stages. The functionality and reliability of these robots aren’t good enough. Most of the service robots are working in the unstructured environments much more complex and dynamic than the factories, such as agricultural, transportation, construction, energy, retail, hotel & restaurant. These service robots should offer the flexibility and agility to remain productive and improve quality while adapting to meet increasingly diverse end user needs. The proprietary and interdependent solution is popular in the service robots industry. For the industrial robots, the architecture of the robot is mature. These key components in industrial robots are already standardized. You can easily find standardized key components off the shelf, such as robot controller, servo drives, servo motors, gearbox, gripping systems and teach pendant. For the service robots, a large portion of the professional service robots are customized “end-to-end solutions” according to users’ specific requirements. The professional service robot companies have to cooperate with their customers very closely, to develop customized solutions, for dedicated applications. These customized solutions are targeted to achieve high performance but very expensive. Some service robots companies try to build their own key components to make better performance robots. For instance, Boston Dynamic believes the customized unique hydraulic systems are much better than the standardized electric motors solutions. Almost every version of Boston Dynamic’s robots is based on a customized hydraulic system. From the components supplier point view, once the dedicated robot market grows big enough, the component suppliers have the incentive to turn the customized components into standardized components. With the components being standardized, some automation suppliers are trying to produce modules, such as the modules integrating motors and drives, the modules integrating motors and gearbox, and the module integrating controllers and drives. These modules are not specific for industrial robots but also for other machines. The reason is that the industrial robots market is too small (only 252k industrial robots shipped worldwide in 2015) for an independent component supplier to build modules only for robot companies. In order to achieve high performance, some robot companies try to build their own module. For instance, Staubli has integrated motor and gearbox into a module, which is compact, accurate and efficiency. Otherwise, the consumer drones market, with 2.5 million unit shipment in 2015, was big enough for the independent component companies to provide standardized products, such as BLDC motors and controller ICs for drone applications. Moreover, the 2.5 million unit shipment in 2015 is also big and profitable enough for the components companies to produce modules, such as Auto Pilot modules and gimbal modules for drones. Normally, if the modules have some standardized interfaces and can be easily transplanted to other system, we call these modules as platforms. The concept of platform is very popular in robot industry. The core values of platforms are: easy to integrated to other systems, easy to reuse, be compatible to other companies’ products. For instance, some system integrators showcase a solution with Universal Robot collaborative robot mounted on Adept mobile platform. 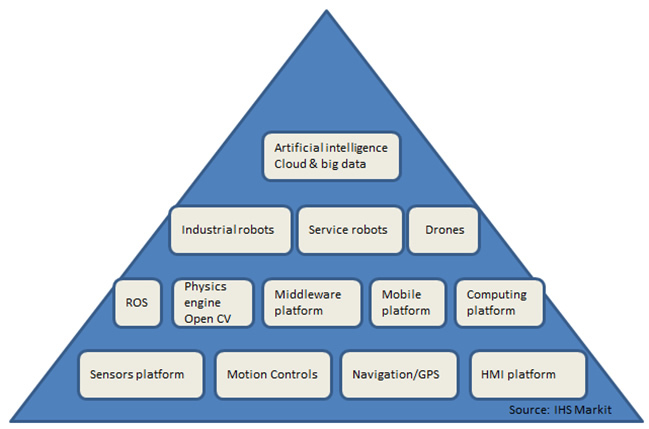 There are several levels of platforms in the robot architecture hierarchy: low level platforms including sensors platform, motion controls platform, Human Machine interface platform; middle level platforms including ROS, mobile platforms, computing platforms and middleware platforms. The robots themselves also can be called robot platforms if they can be reused. For instance, LittleDog and ATLAS from Boston Dynamic are used as a testbed for other institutions. Aldebaran NAO is also used as a humanoid robotics platform for education purposes and football match worldwide. In the high level, the cloud platform, big data platform and artificial intelligence platform are more general and are easy to be integrated to other systems, such as IBM Watson integrated in manufacturing system, financial system, and medical systems. There are two ways for robots companies build their business: penetrating vertically to specific application and expanding horizontally to broad applications. The robots platforms are helpful for robots to expand its territory. With the developments of various kinds of hardware and software platforms, the robots will be deployed in comprehensive industry and applications. For example, drone is a typical general platform for various applications. If you put a pesticide sprayer on a drone, the drone can used in agriculture. If you install a camera on a drone, the drones can be used in media and photograph. With the advantages of Auto Pilot platforms, DJI grabbed the opportunities and successfully switched positioning from the model-plane market to the aerial photography drone market, and then from consumer drones to other professional sectors, such as agricultural and security. Overall speaking, when robots become manure, the architecture of robots will be structured, the component and module interface will be well defined, and various kinds of platforms will create more scaling up and spreading innovations. Before joining IHS, Wilmer was a product marketing manager in the electronics industry. Wilmer holds a BS in Mechatronic Engineering from the University of Electronic Science & Technology of China, and MBA master degree from Shanghai JiaoTong University.